Katherine (Kate) Piderman was born and raised in Vancouver, B.C., Canada, but has lived in the Midwestern United States most of her adult life. She has graduate degrees in theology and psychology and has served in ministerial roles in parishes and medical facilities. Certified by the National Association of Catholic Chaplains, Kate was a staff chaplain at Mayo Clinic in Rochester, MN from 1996-2017. During this time, she cared for patients and their loved ones in several clinical areas, including psychiatry, physical rehabilitation, and hospice. Kate was appointed Coordinator of Spiritual Research in 2007 and remains in this role. 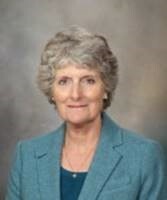 She is also Associate Professor of Psychiatry in the Mayo Clinic College of Medicine and Science. Kate has led several research projects related to spirituality and health, including a large survey project assessing hospitalized patients’ expectations of chaplains and a pilot study on developing a spiritual legacy with those with advanced illnesses. She has over thirty peer-reviewed publications and has spoken widely within the United States and Canada, as well as, Israel, Ireland, and the Netherlands. She is appreciated for her ability to make research intelligible and applicable to the care of patients, and for her kind and gentle manner. Kate loves the outdoors and beauty of nature. She may be found swimming, hiking, biking, kayaking, cross-country skiing or snowshoeing, as she embraces in the varied seasons on Minnesota. Kate is grateful for the opportunity to share some of her clinical and research experience. In turn, she will encourage us to share our own experiences and reflect on continuing the quest to bring our best to our ministry.